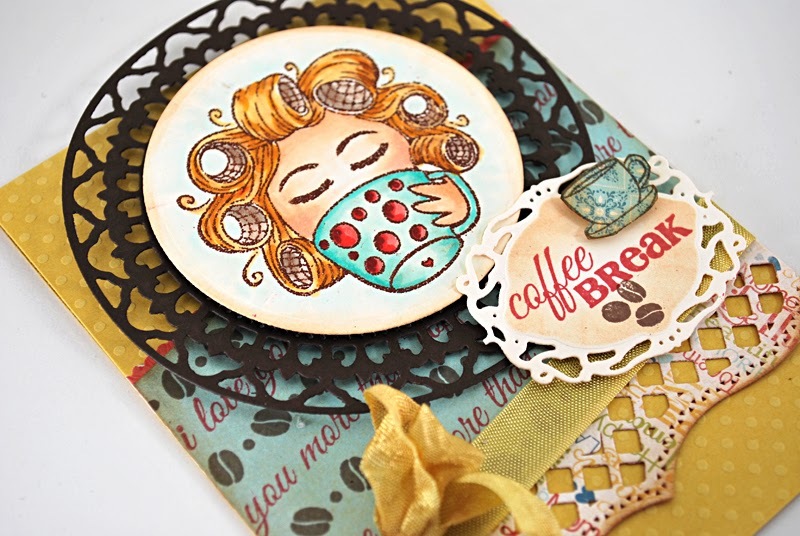 The Rubber Cafe Design Team Blog: It's a Coffee Break Time! It's a Coffee Break Time! 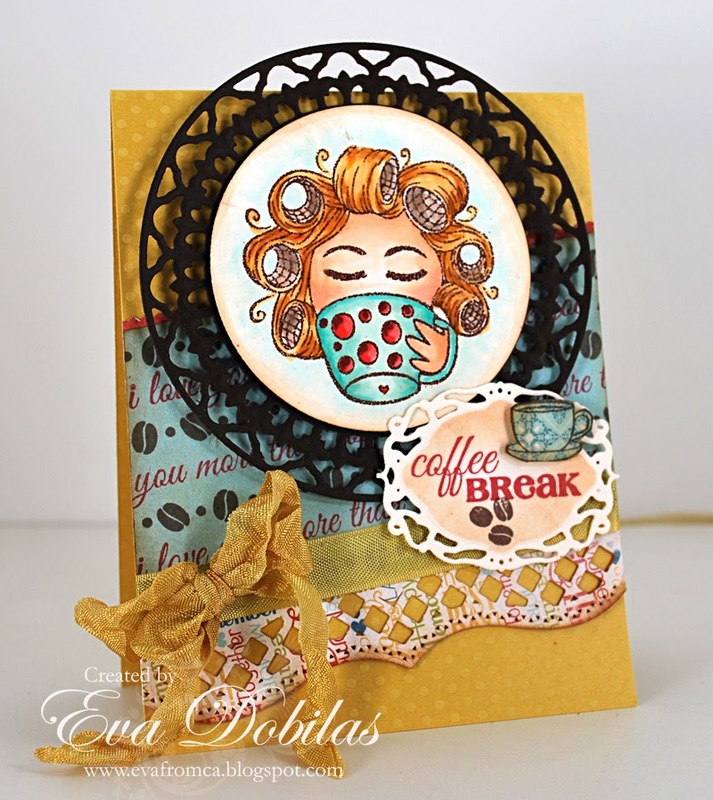 Hi there, this is Eva here with my first Guest Design post for this month and today I am using the the super fun February Creative Cafe' Kit of the Month-Tea for Two. I decided to create with the lady as my focal point and I embossed her on the cream card stock using the brown embossing powder from the kit and colored her with Copic markers, than cut the image out with Spellbinders Circles dies. 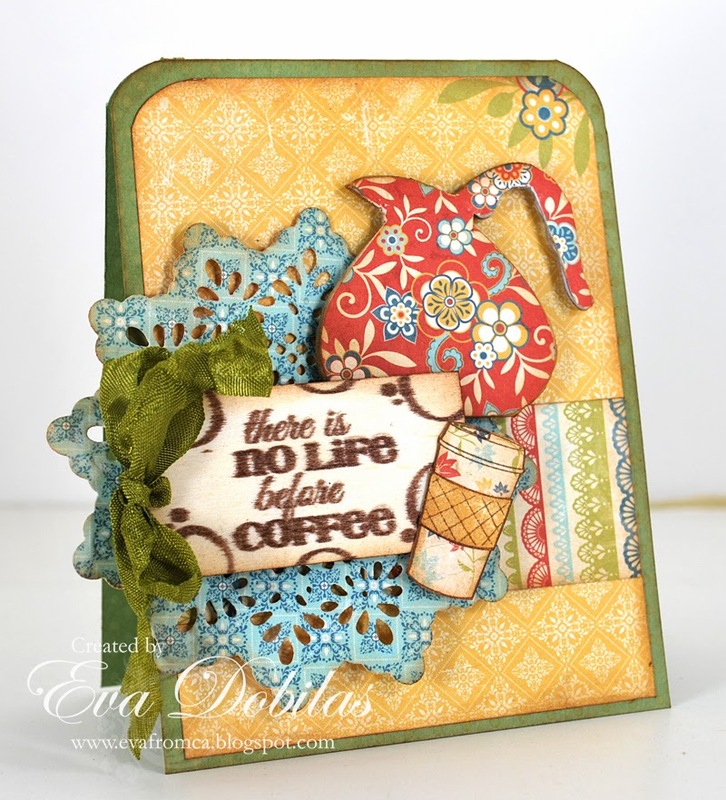 I than layered it with brown Spellbinders Splendid Circles die cut. 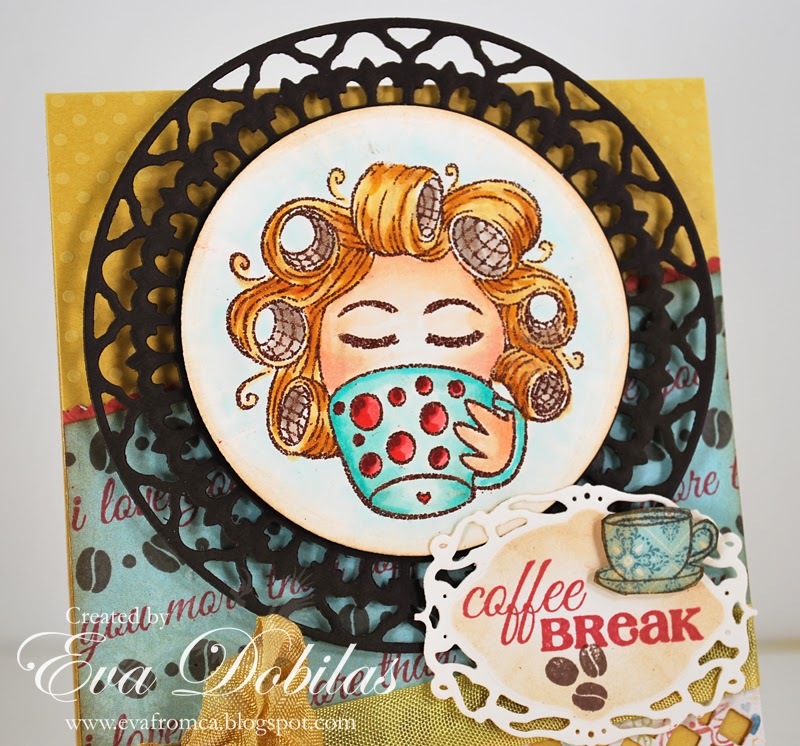 I also stamped the coffee border and "I love your more" sentiment to create a background paper, which I layered my Splendid Circles element on top of. I die cut a border using Spellbinders A2 Bracket Borders One dies. I stamped my sentiment onto a label cut out of Spellbinders Opulent Ovals dies. I also stamped one of the little cups onto patterned paper and added it to my sentiment label. Finally I added a sweet seam binding ribbon, once again from the kit. My next card is using the same Coffee stamp set and this time I used the wooden tag to stamp my sentiment onto with brown ink. I also added the coffee circles to it. I added a fun seam binding ribbon in my tag. 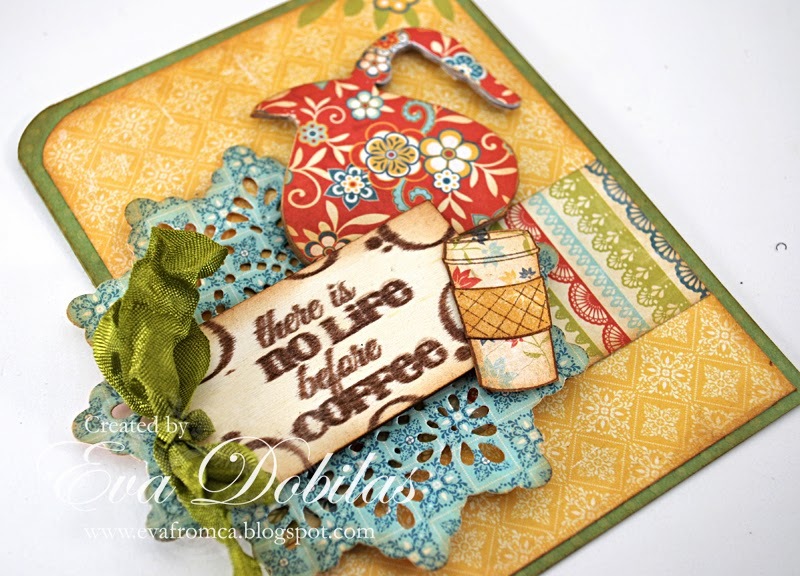 I added patterned paper to the chipboard and stamped my travel coffee cup with two different papers to paper piece it together. On this card I also used Spellbinders Delicate Doilies dies. I just thought it would make a perfect little addition to my card. Well, that is it from me today and I will be back later to share more projects created with this awesome kit and next time it will be all about tea! 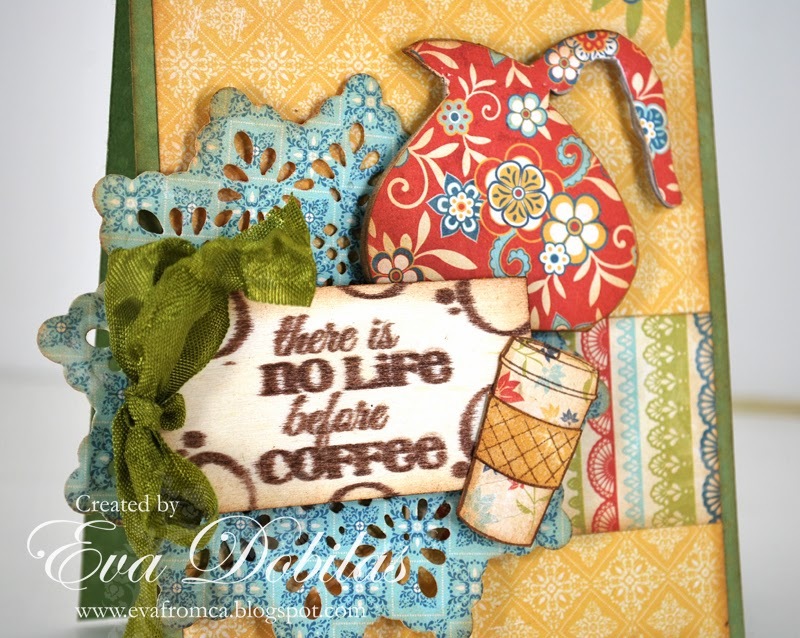 Eva- love your color pics! So happy to have you join us this month!